Rachel Maddow has been waxing eloquent of late about what she considers "abuse" of the filibuster rule in the Senate by Republicans "obstructing" the legislative process. She ignores the simple fact that there is a 60 vote filibuster proof Democratic majority in the Senate, making it mathematically impossible for the Republicans to maintain a filibuster on anything. At worst, they can be accused of enabling Democratic party obstruction on any given bill. That said, she and Ezra Klein make some interesting points in Monday's show about the history and evolution of the filibuster rule in the Senate. As any good partisan, Rachel complains loud and long about the GOP "abuse" of the filibuster, while glossing over the Democratic "abuse" of the same procedural tool. To be fair, she does make a perfunctory mention of the Democrats use of the filibuster to block George W Bush judicial nominations. The Republicans had a smaller majority in the Senate at the time, so the Democrats then (unlike Republicans now) actually could filibuster anything. MADDOW: "Well, this has been a subject of frustration to people in both parties at different times and at different, more or less, convenient intervals... How hard is it to get rid of the filibuster? I feel like I‘ve read a lot of different analysis about how many votes it would take and what process you‘d need to kill it if you wanted to. KLEIN: "People disagree on this... What you‘d basically, I think, need to have is Congress will need to remember that it is supposed to be an independent branch of government that is supposed to act on major, going concerns. And so, you‘d have the two parties get together and decide, “We don‘t want it to be the case that when we‘re in the majority, we can‘t do any of the things we promised the American people we‘d do.”And so, six years from today, when we don‘t know who will be in power the filibuster phases out. But for that to happen, you need Congress to begin acting like a branch of government and not just an attachment or an accessory of the president—which hasn‘t been the case for sometime now." Somebody once said something about the consequences of failing to learn the lessons of history. You might think Ezra and Rachel would learn something from the Republicans who were once so exercised by Senate filibusters, and who are now - less so. But, let's go with Ezra's six year proposition. Contrary to his assertion, we can make an educated guess at what the Senate will look like six years hence. Chris Mathews: "Who is the most vulnerable Democrat?" Chris Matthews: "Can a Republican lose this year coming up? Can a Republican incumbent lose any race anywhere next year? Charlie Cook: "I would not be surprised to see no Republican incumbent House or Senate lose." Even if there was a five seat shift, the Democrats would retain a majority with Joe Biden breaking the partisan tie. I am sticking with my forecast of a net gain of 3 seats for Republicans. Regardless whether it is 3 or 5 in 2010, it gets more interesting in 2012, when the field tilts dramatically in favor of Republicans. Of the 33 seats contested, the Democrats will be defending 24 seats, and the Republicans only 9. Even if they win 2 seats in 2010, it is virtually a fait accompli that the GOP will retake the Senate majority in 2012. In 2014, 21 of the 33 seats are defended by Democrats and 12 defended by Republicans. Again - advantage GOP. Which brings us back to Ezra Klein's plan for phasing out the filibuster. 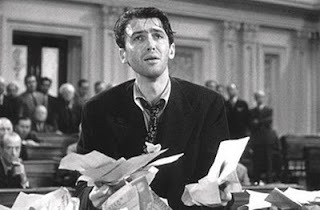 "And so, six years from today, when we don‘t know who will be in power the filibuster phases out...". Uh Huh. Should Klein's plan actually find support on the Senate floor, it raises the specter of a simple majority of Republicans in 2015 undoing the Health Care plan that required a 60 vote Democratic plurality in 2009. Definitely in the "be careful what you wish for" category. OTOH, should the Democrats sponsor such a measure in the Senate, they might find some surprising bi-partisan support from Republicans with a somewhat longer view.